I'm only taking two classes this semester; one is yet another course in California native plants, and the other is a course in Nursery Management. (I had also signed up for a course on Plant Diseases, but it was cancelled because the person who teaches it retired, so they are searching for another disease expert.) My Nursery Mgmt professor requires us to get out in the community and research some sort of nursery operation, ideally volunteering some time there, and interviewing the owner or staff. Recently I read an article in our local paper about an organic flower farmer about 20 miles south in Sunol. I decided that was the perfect place to visit, so I contacted the owner, and spent about three hours there on Labor Day, weeding a row of flowering oregano and chatting with whoever came near. I also got to spend the lunch break with the team and ask more questions. It was a very interesting morning! Joanna Letz is the owner of this two-acre, organic flower farm called Bluma. The farm is located in an area called the Sunol Ag Park, which is owned by the San Francisco Public Utilities Commission and managed by the Alameda County Resource Conservation District. There are six farms located within this land, which is in a sort of bowl-shaped valley surrounded by hills. Two creeks meet here, and it's easy to see the watershed influence on this land. The soil is very beautiful and Joanna adds 36 cubic yards of compost every year at the start of the growing season. That is the only additional fertility this land needs. 4th-6th grade students come here to learn about organic farms and local watersheds. There is a 59-foot high 'water temple' built on this land, which speaks to the history of water here. This temple was built in 1906 and originally collected water in a cistern which was then funneled to San Francisco though the Niles aqueduct. There are paintings on the roof of the temple. It's closed to the public now (though that might be temporary), but I visited there many years ago in my letterboxing days. You can see the water temple at the far left of this photo. My 50-foot row of oregano was surrounded by a vast variety of weeds, many taller than me. It took me 2-1/2 hours to weed my row, and by the end of it I was pretty pooped. And my hands hurt badly this morning, evidence of the repetitiveness of the activity of grasping and pulling. Farming seems increasingly to me to be a young-person's game. At least this kind of small-scale farming. Joanna works the field from early April to late October, and then rests it by planting a five-seed cover crop, including things like hairy vetch, to return nutrients to the soil. Sometimes she uses weed cloth, but mostly the weeding is done by hand. The weeding is not about elimination; rather, the focus is on knocking back a lot of the large growth so that the flowers can get the sun and space to dominate. So nearly every row of flowers is in some stage of weed overgrowth, and the weeding is just as frequent a task as harvesting. Meaning, basically, it's an everyday task. You can't even see the oregano through these weeds. My row when I was finished. I was instructed to pile the weeds up in the path on either side of the row; they will break down and feed the soil. However I did pull a lot of weeds that had a LOT of seeds on them, so those will likely germinate at some point and continue the cycle. So this practice is both good and not-so-good. While I weeded, the rest of the staff was harvesting bunches of flowers for delivery. Joanna makes deliveries three days a week to local grocery stores and restaurants. She doesn't do the arranging, unless she is providing flowers for a wedding or other big event, which is a couple of times a month. She used to sell at Farmers' Markets, but doesn't any longer. 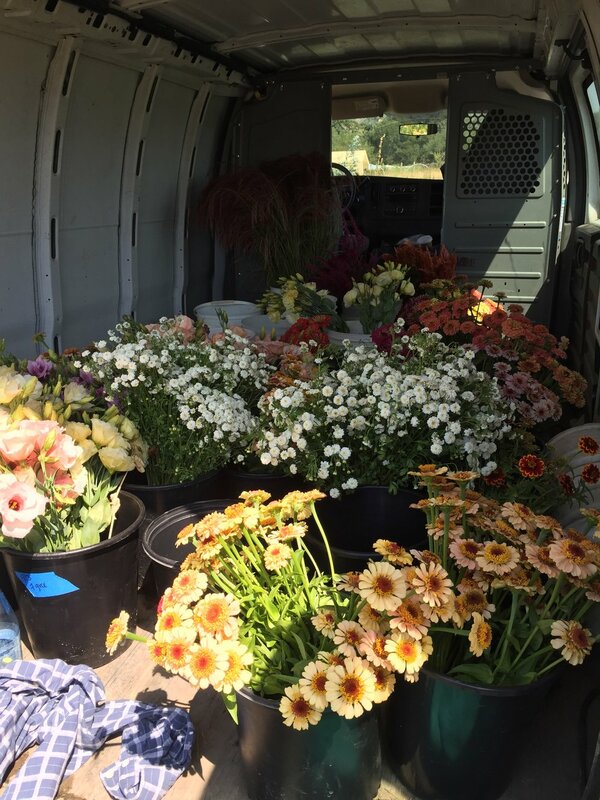 The flower bundles go in to a truck which follows the crew, and then into a cooler at the end of the field, that is shared by many farmers. Joanna shares a greenhouse with another farmer in this area and that is her main propagation space. It was fun to walk by that other farmer's fields, too - and see how he does large-scale (well, larger than mine anyhow) tomato and pepper farming. I was pleased to see that he also has cut down superfluous growth on his tomatoes (all of which were small cherry and saladette types) and interested to note that he has done the same on his peppers. Guess I need to take a hint and do that too. The crew and I sat in an outdoor learning classroom (just basically a few picnic tables covered by a tarp) to eat our lunches, brought from home. Three of the staff are part-time workers - one works once a week, one three days a week, another is on-call. Only one is full-time (other than Joanna) and she works six days a week. There could be others that I didn't meet, and in fact, there must be. They all work from 6:30 am to 5:00 pm, a very long day. This is out in hot sun without any shade, of course. All of them are young, in their 20's, and all of them care about food justice and good organic produce. When asked what they wanted people to know, they said "buy your food and flowers at the Farmers Markets." Large-scale flower farming is overwhelmingly conventional, using pesticides and herbicides at will. Many also use specific hormones to enhance the crop in some way. Organic flowers cost more, and should, as I learned just from my one scant weeding session. Joanna uses the tractor only to create rows at the beginning of each planting, so this land is also largely no-till. While the weeds are a hassle for the workers, they are good for the soil, keeping a living root growing at all times and feeding the microbial life that lives there. This type of farmer recognizes that keeping the soil healthy will keep the crops healthy, and the downside is the weeds. But it's worth it to see the amount of insect life on an organic farm. Joanna's fields were full of a huge diversity of pollinators, and I saw very little evidence of pests, and trust me, I would have seen them if they had been there. Goodness me, it was my own private little jungle. I looked up from my task to take this photo of Joanna, the owner, harvesting flowers. I learned an awful lot just by spending the morning with these young, energetic, committed farmers. I encourage you to do the same in your neighborhood, if only to recognize the hard work farmers do to make our lives beautiful and delicious. Especially in our desk-and-computer-oriented tech society. We have it so easy in so many ways! And yet, even though the work was hard yesterday (and I was super relieved to go home after lunch instead of finishing out the day), there were tremendous benefits: Being outdoors in the sunshine, smelling sweet oregano as I brushed past it to pull a weed; using my body the way it's meant to be used, stretching and reaching and squatting and crawling; having my knees in the good dark earth and smiling at the earthworms as they revealed themselves to me; hearing the distant chatter from the other workers but not having to engage unless I really felt like it; the satisfaction of being set a task and completing it before leaving for the day; and the sweet knowledge that I didn't have to organize anyone or figure out the next step or spend time at home figuring out the logistics of the thing. I did not hear one mobile phone ringing. Instead I listened to the hawks and crows and jays. I saw a kestrel fly over the fields. Someone came by to visit the farmers and discussed powdery mildew. It was all very present and NOW. And I imagine that this sort of work could be quite addictive. Hard to choose a favorite flower from this farm, but this one might be it, some variety of zinnia that I haven't grown, but definitely need to!